Sigh. This book. I finished it last week and needed to take a few days before writing this review because I needed to decompress and not fill this entire post with expletives. I’m actually thinking that 3 flames is somewhat generous but I’m taking into consideration how I felt about the first two and I just can’t give it lower than that. With that said, again I will do my best to provide a spoiler-free review. The beginning of this book was good, bordering on okay. There was a lot of walking and traveling and angst but Bardugo did a decent job at breaking it up with some action. 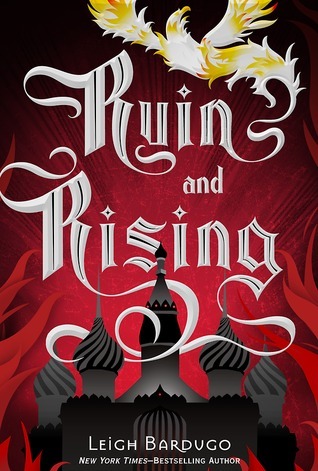 There was not nearly enough of Nikolai or the Darkling IMO and I was real sick of Mal being a whiny baby (which started in book 2 but got progressively worse in this one). I would say it started to really go downhill around the halfway mark (maaaybe pushing it to the last third). Some events happen that just make you go “…ummm WTF?” and the ending was just so totally contrived that I can’t even talk about it without getting cranky. Both The Darkling and Nikolai deserved better conclusions than they received. I felt like there was so much more to their stories that could have been explored or just done better. I took some time to read lots of Goodreads reviews to see if I was just crazy or if people felt the same, and I could not describe my feelings for this book better than Goodreads user Khanh. Her perfect review in analogy form can be found here. I think the most disappointing part for me was how GOOD the first book was. Perhaps I set the bar too high but my goodness I just felt like this last book was a total let down. I am still extremely excited to read Six of Crows, but I need to take a little fantasy break for right now. Have you read this trilogy? What did you think of the conclusion? Ugh could not agree more. One of the biggest disappointments of any trilogy ever.